I am a lightweight backpacker with a typical weekend pack weight of 15 lb (7 kg) and a multi-day weight of 20 lb (9 kg), which includes food and water. Because I pack less than 20 lb (9 kg), I prefer lightweight trail-running shoes. 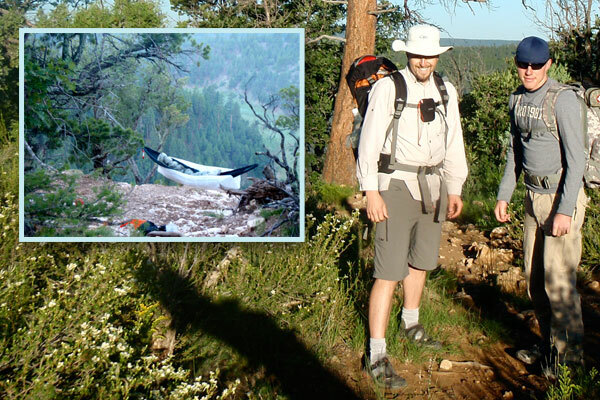 I prefer backpacking with a hammock as part of my sleep system. Warranty "If you are not completely satisfied with the quality and performance of your Bridgedale socks at any time within 1 year of purchase, return them to the place of purchase together with your proof of purchase for exchange." The Bridgedale Bamboo Men’s Crew sock is a mid-calf high sock made of a combination of bamboo fiber, Coolmax polyester, nylon, and a little lycra for support. The socks have extra padding on the bottom heel and toe areas. Around the ankle and mid-calf, the socks are thin and light. Across the bridge of the sock are some of the Lycra elastic. 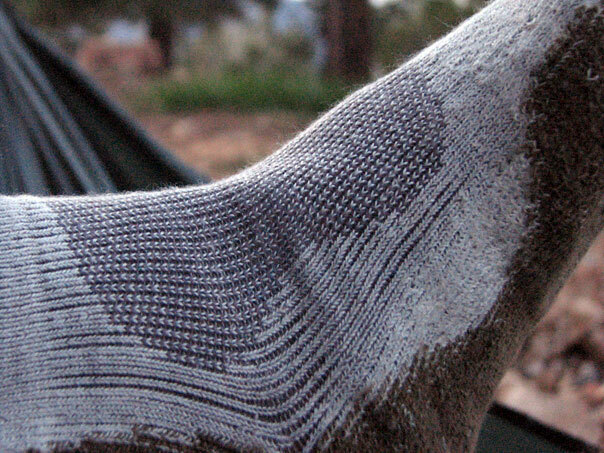 Across the toes, the brand-name “Bridgedale” has been integrated into the sock. On the bottom of each sock, the letter “L” is also visible in the stitching. The socks feel smooth and moderately silky in places. When I showed my wife the socks she was shocked when I told her they were made of bamboo. I guess we were all expecting a more stiff, fibrous texture, but these socks are the opposite: smooth and flexible. They feel and work like “normal” socks. The wear is nice and comfortable. I like the extra padding on the sole of the sock. There is also extra padding running up the heel and Achilles tendon, presumably for ankle-high hiking boots. It does provide some extra insulation and padding where shoes typically rub. Bamboo is supposed to be good at resisting odor. For the past two days, I’ve worn the same pair of Bridgedale Bamboo socks in some leather boots to work and so far they’ve passed the “smell” test. I can sense a trace odor, but nothing striking as I would expect from past experience. The socks remain tight around my feet, so I intend to wear them a few more days initially to see how they hold up for both wear and odor. PRO—Nice, smooth fit. Seems to resist odor. Comfortable. I have used the socks on a total of 9 days, which includes 3 day hikes and 3 overnight backpacking trips totaling 19 miles (31 km). All of the trips were in northern Arizona, at a mean elevation of 7000 ft (2133 m). The low temperature was 29 F (-2 C) and the highest daytime temperature was 80 F (27 C). Most of the terrain was rocky, single track trails, some near meandering streams. In addition to field use, the socks have found their way into my regular routine at home and on a few occasions at work. May 15–16, 2010 ~ Pumphouse Wash, Arizona. One of two overnight camping trips with my three oldest sons. The elevation was around 6000 ft (1829 m), heavily forested, with a river flowing down into the slot canyons of Oak Creek. Low temperature was 29 F (-2 C) and the high was 68 F (20 C). May 28-29 ~ Sycamore Rim Trail, Kiabab National Forest. After taking my sons on consecutive overnight trips, I needed to take my daughter, age 8, to make it fair. We backpacked near the Sycamore Creek and hammock camped. We also hiked KA Hill, elevation 7287 ft (2221 m), an elevation change of 1017 ft (310 m) from our camping spot. I carried food for both of us and my pack weighed 12 lbs (8 kg). June 5 ~ Old Caves Crater, Coconino National Forest. I took all my kids (ages 2 to 8) out on the cinder mountain near our home for some hiking and geocaching. We hiked over 3 mi (~3 km) to the summit at an elevation of 7183 ft (2189 m), an elevation change of 583 ft (178 m). The trails were easy, with several patches of sand and cinders. July 1–4 ~ Fremont Indian State Park, Utah. At an elevation of 6000 ft (1829 m), I expected this central mountain area to be more heavily forested, especially with a major river and several tributaries running through the area. Instead, this area of central Utah was arid, hot, and wind-stricken. This event was a major car camping expedition with the extended family. I was given two pairs of the bamboo socks for testing and I’ve opted to keep on pair unworn as a “control” of sorts. Happily, the worn pair has held up very well, although I’ll admit that they haven’t seen heavy use. 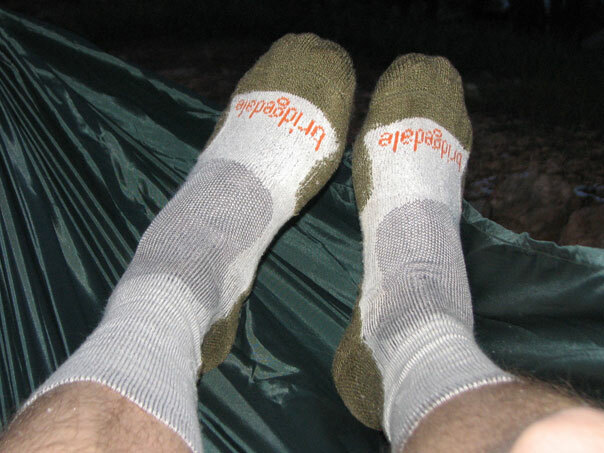 On most of my trips, I wore sandals and I would switch off going without socks hiking in to camp, wear the socks overnight for insulation, and then hike out wearing the socks the next day. This has been an interested method for testing because I’ve been able to feel a great comparison with and without the socks. Overall, I find these socks very comfortable and warm. They have held up on my legs very well and seem to compare well to the unworn socks. With the sandals, the comparison is like day and night. The socks add a level of comfort, reduce friction, and have kept debris out of my sandals very well. Unfortunately, the socks are also very warm, and I often push the socks down around my ankles to reduce the insulation. I have subjected my wife to the “smell test” more than once, trying to guage the level of aroma from the socks. Personally, I can’t fault the socks for smelling badly at all. For the smell tests, I would wear the socks for a few days without washing and when coming home, have my wife smell them. In one case, I wore the socks to work in leather shoes — a nice, hot, sweaty climate, perfect for bacterial growth. My wife’s response on one occasion was interesting to me, “it smells like a tree, or something.” She’s never said the socks smell badly, but sometimes “odd,” which I can’t yet determine is a bad smell or a good smell. Overall, I like the socks, although the high-calf style has proven a bit warm this summer. PRO—The padding and insulation work great; the socks have retained their elastic very well. I have used the socks on multiple day hikes, around town, and even at the office. Here are few highlighted backpacking trips where I took the socks. July 16-17 ~ West Fork of Oak Creek, Coconino National Forest, Arizona. I convinced a co-worker to do an S24O trip (less than 24-hour trip) into the Oak Creek Wilderness area. Immediately after work, we drove down to the canyon and hiked up the creek about 4 miles (6 km) and hammocked in the canyon. The elevation was level at 5400 ft (1646 m) and the overnight low was in the mid-60s F (16 C). We were up by 4 AM and back on the trail and back to our car, passing folks just rising for the day. Aug 7 ~ Cedar Breaks, Utah. A few day hikes with my wife. The elevation was over 10,000 ft (3000 m). We encountered a few sprinkles of rain (the tail end of a thunderstorm) and temperature of about 40 F (4 C). Aug 13-14 ~ Fisher Point, Coconino National Forest, Arizona. Another S24O trip just outside Flagstaff. The 9-mile (14.5 km) trip took us through skunk canyon (6600 ft/2011 m) and up to the top of Fisher Point (7000 ft/2134 km). We pitched our hammocks on the edge of a cliff. Overnight low was 48 F (9 C). Sep 3-4 ~ Sycamore Canyon Rim Trail, Kiabab National Forest, Arizona. This 11-mile (17.7 km) loop hike was cut short due to my daughter getting ill, but we enjoyed a wonderful 6-mile (9.6 km) overnight backpacking trip along the Sycamore Canyon near Paradise Forks. Overnight low was around 50 F (10 C) and the elevation was 6700 ft (2042 m). These socks have really held up very well over the last few months. 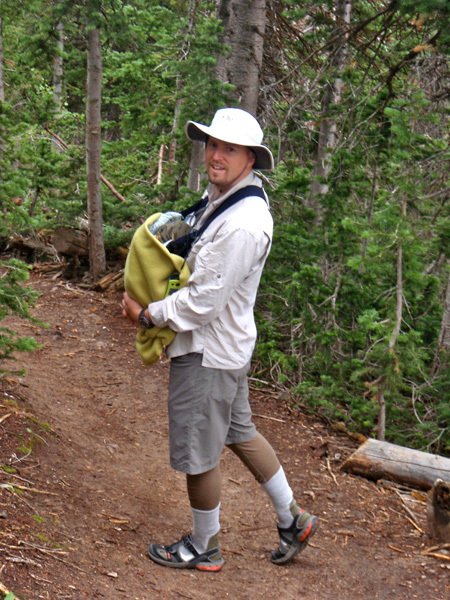 My typical performance measure was while I wore hiking sandals, but on all my day hikes I wore trail runners exclusively. On my last trip to Sycamore Canyon, I also wore trail runners. The socks were a little long, especially during the summer considering my shoe choice (I don't own expedition-style boots), but I was able to "modify" the socks by wearing them low around my ankles, as pictured on my hike to Fisher Point. On my hike to Cedar Breaks, Utah, the temperatures were really cool. We arrived on the mountain after a thunderstorm, so everything was wet and cold. My wife and I were only wearing shorts, but thankfully I had the bamboo socks and some thermals I was able to pull on to stave off the cold. The socks have really held up well. The elastic is still strong and the socks hold up on my legs nicely. In comparing the two pairs I was given—one being kept pristine in my closet—the used sock shows slight fraying or fibers bristling around the sock, but for the most part it remains in very good shape. I haven’t noticed too much sweating or water build-up with these socks, but I’ve also used very ventilated shoes and sandals during the test period. I experienced no hot spots in hikes over a few hours and 10 miles (16 km) at a time. I really like the bamboo socks. I will continue wearing them, especially as the temperatures cool in the fall. PRO—Comfortable, durable, and breathe well. 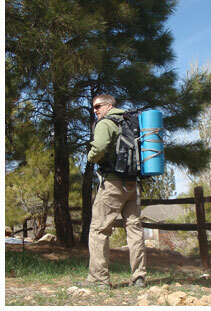 I would like to thank Bridgedale and BackpackGearTest.org for providing me with the opportunity to test this product.